Loads of news on the new PTV including the massive changelog, an explanation on the improved combat system and more! - Animals will now hit you in a random body part. - If your head or torso reach zero, you will die. - Low head health will result in a lower hit chance. - Low arm health will result in weaker hits. Almost everything is now based off your world mode, for example the rate at which you can catch diseases after eating raw food or standing near a corpse and finally even more world generation fixes and tweaks for even more cleaner world generation! - All sounds converted to OGG. - New willow and dead tree graphics. - Massive world generation fixes and tweak! 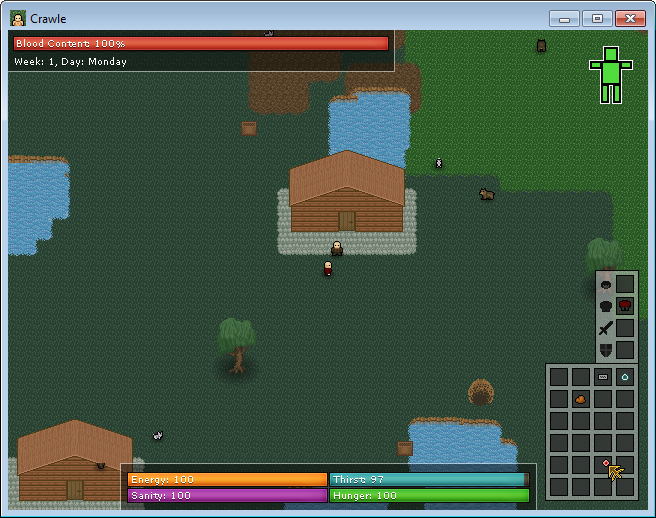 - Optimised the stat system (not based off FPS anymore). - Fixed the invisible blocked objects. - Biomes now fill the entire map. - Fixed energy being taken when missing. - Fixed energy regenerating whilst in combat. - Fixed the file not found error with Unforgiving worlds. - Fixed the permadeath input check bug. - Fixed the inventory not taking 3 random items in normal mode. - Replaced world passwords with a confirmation box. - Night is less dark. - The GUI is now hidden by the H key. - Moved the door inside houses to the left a bit. - Made walking and running a bit faster. - Animals no longer drop random loot. - Animals no longer despawn on death. - Damage is now increased depending on the animal. - You can no longer spam attack. - Diseases can now happen from being near dead animals. - Removed airborne (random) diseases. - Updated the combat tutorial. - The health bar is now a blood content bar. - Baskets now can be searched using right-click. - Added proper items to baskets. 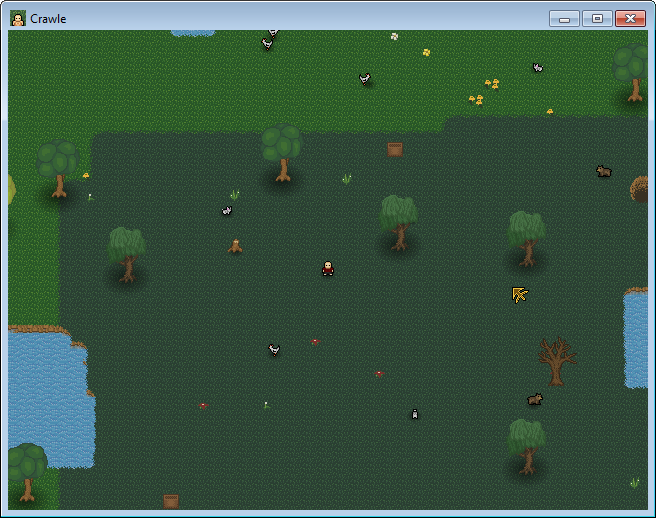 - Added proper items to chests and pots. - You now have to unlock steel chests. - Removed the sand biome. - Animal damage is now based off the world difficulty. - Stone no longer spawns in the overworld. - Hit chance is now based off the player's arms' health. - Energy reduction is now based off the player's legs' health. - Disease chance is now based off the world mode. - Animals can no longer simply hit you for 0 damage. - Items are now actually saved in the world file. - Equipable weapons & armour. - Animals can now be skinned and butchered. - Animals can now be picked up. - Added a disease and health tutorial. - Worlds are now automatically saved every 10 mins. - You can now 'Quick Save' with F.
- Health & Disease tutorials. - The ability to bleed. - New health system based on body parts. - Drag and drop in inventory. - You can now re-view the tutorial using the T key. "- Animals will now hit you in a random body part." Well at the moment we only have chickens, bears and rabbits so that isn't something I really considered, but I will, thanks :].